Maruti sets records in March as Swift and Alto top hatchback sales charts! Call it the budget scare, call it corporate tax mania. 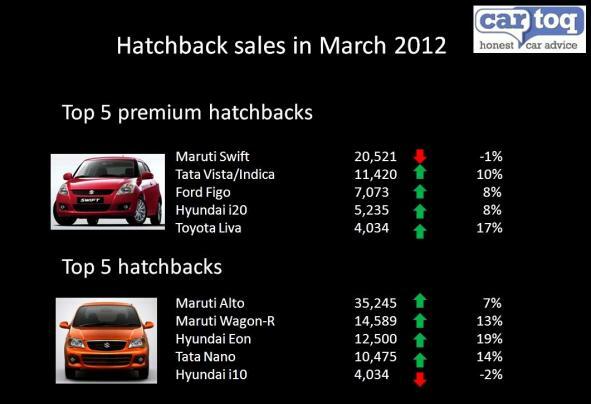 Whatever it was, March has been a great month for hatchback sales in India. And the carmaker that has been laughing all the way to the bank is Maruti, whose best-seller the Alto is back to near record sales numbers at over 35,200 units in March. While these kind of numbers were expected from the Alto, Swift buyers will have to wait less now for the Swift, since Maruti has rapidly expanded capacity to meet the huge demand for the car. 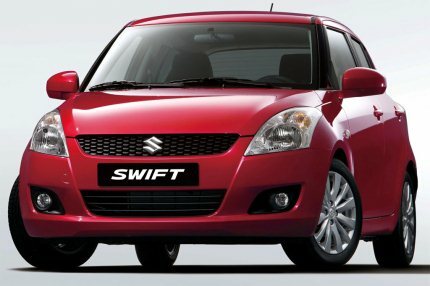 In March, Maruti sold another 20,500 Swifts, a couple of hundred cars less than February, but a huge number nevertheless. Maruti’s biggest rival, Hyundai, managed to finally get the Eon to exceed its monthly sales targets. The Eon managed a respectable 12,500 cars in March after blitz of advertising and exciting offers from Hyundai dealers. Still, it hasn’t been able to overtake Maruti’s Wagon R, which takes third spot, on the hatchback sales charts with 14,589 cars being sold. The Eon is now, officially, Hyundai’s largest selling car, overtaking the i10, which has stagnated at about 10,100 odd cars. Tata too has had a good run in March, with sales of the Nano breaking 10,000 after nearly a year. Read more on Nano sales here. Its Indica and Vista combine (they report numbers together), sold 11,400 odd cars, its best showing in nearly two years. While Ford hasn’t had much luck with the new Fiesta, its hatchback, the Figo, has had one of its best sales in a year, with sales nearly at 7,100 cars. The Figo saw a dip in sales on account of the sudden surge in demand for diesel engines, which Ford was struggling to meet initially, but has now managed to get up to speed. Demand mix is at 80% of the diesel variant and 20% for petrol. Honda too has had a very good month of sales in March, after getting its plant back to full capacity, and as supply constraints ease. The Brio has taken off with a whopping 6,355 cars sold in March, up from 2,046 cars in February. The Jazz though is still in a tight spot as kits are limited, and Honda can still make only about 600 a month, and it sold 535 of them in March. Since most of these numbers were pre-budget, and all carmakers have hiked prices post budget, expect some slump in April sales figures. The hatchback segment is particularly vulnerable to price hikes, because this is a price-sensitive segment, where even a Rs. 10,000 difference in the price of a car can swing decisions.